Ok, so I posted this on facebook and in the Lemon64 forums but this is probably a better place for it. 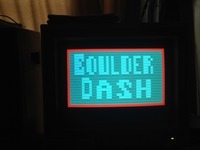 I am re-writing Boulder Dash in native C128 80col mode. The whole map fits on one single screen. I am using character mode with 16pixel high fonts and interlace mode to make it all fit on screen. 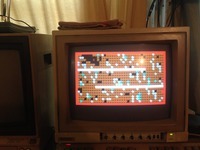 There is a link here to a WiP that you can try on real hardware but acts strangely in WinVICE. I have had a lot of fun making the VDC dance and would appreciate it if somebody with a real 80col colour monitor could take a good photo of how it looks. I am using an RGB to HDMI adapter that messes up the interlaced graphics. It looks quite sharp in VICE (bottom half of the screen is missing). Anyway, comments and help welcome! I particularly need help making the SID work now as silence is not golden when you expect a tune during the title page. Also, if anybody has a suggestion on how to get more than 2 colours per character it would make it look much nicer. Oh, thanks! I'm not on the Lemon forums, and so, I wouldn't have seen this (or I wouldn't have found out about this until much, much later). I'll try it out on my NTSC C128DCR as soon as possible. P.S. Oh-oh, when I clicked on your link above, all I got was a webpage named Mega.nz and nothing else. When I click it I get a page with a download link, is it not working for you? I'll give it a spin this weekend (time permitting) on real C128 and snap some photos for you. Glad to see some work on C128 software! Heh, that one didn't work either. The bottom part of the page (where the link was) would not load. I had to go to an Internet cafe and use their high-speed wifi to get the full webpage. Now the program is downloaded. Fire on joyport 2 to start in case you didn't realise.... Yes, the first 3 levels are playable. Hey now! Working fine with the mouse in joystick mode! Play response is good. Nice job, good start! Nope, other than it's only the first 3 levels so far. I need to add some text at the bottom showing the timer and gems etc as well as some more work on the game engine and putting more levels in. I got sidetracked trying to work out sound and making the SID work from cc65 is quite a mission. How does it look? It's hard to tell from that last photo (you moved!) The positioning and size looks good, does it flicker much? Do the graphics look convincingly like Boulderdash? Does Rockford animate well?